Maximilien de Robespierre was the leading voice of the government that ruled France during the French Revolution. He was largely responsible for the Reign of Terror, in which thousands of suspected French traitors were executed. Maximilien François Marie Isidore de Robespierre was born on May 6, 1758, in Arras, France. His mother died when he was only six and his father, a lawyer, abandoned the family soon afterward. 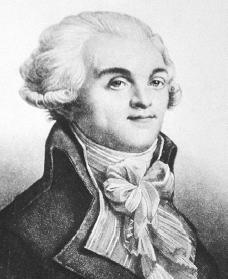 Robespierre received a law degree from the Collège Louis-le-Grand in Paris, France, and practiced law in Arras. He began to assume a public role as a voice calling for political change and wrote articles detailing his opinions. At age thirty he was elected to the Estates General, the French legislature. support in the legislature. He favored giving the vote to all men, not just property owners, and he opposed slavery in the colonies. Robespierre was more popular at meetings of a Paris club called the Jacobins, whose members admired him and referred to him as "the Incorruptible" because of his honesty and firm sense of right and wrong. When Robespierre's term as a legislator ended in September 1791, Robespierre remained in Paris, spending time at the Jacobins and publishing a weekly political journal. During this period he was a critic of King Louis XVI (1754–1793) and those who supported a limited, constitutional monarchy (rule by a single person). Robespierre, deeply suspicious of the king, spoke and wrote in opposition to the course of events until August 1792, when the monarchy was overthrown and the First French Republic was established. A group of representatives was quickly elected to draft a constitution and to govern the country in the meantime, and Robespierre was elected to attend. As a spokesman for the Jacobins in the National Convention, he was a harsh critic of the king, who was finally placed on trial, convicted, and executed in January 1793. In the months that followed Robespierre turned his anger on a group of moderates (those who prefer less abrupt change) called the Girondins, leading the effort to have their members removed from the convention, arrested, and executed. In July 1793 Robespierre was elected to the Committee of Public Safety, which acted to protect the republic during the dual problems of foreign war (most of Europe was fighting against the Revolutionary government in France) and civil war (which threatened to bring down that government). It executed people who were suspected of supporting the king or making plans to take over the government. Thousands were put to death with a quick trial or no trial at all. This became known as the Reign of Terror. Robespierre faced increased opposition on both sides. Included among these were the Hébertists, a group that controlled the Paris city government and was upset with wartime shortages and increased prices, and the Indulgents, moderate Jacobins who felt that the Reign of Terror should be relaxed since the war had ended. Robespierre had leaders of both groups rounded up and executed, including Georges Jacques Danton (1759–1794), who had once been a close associate of his. Robespierre and his supporters claimed that they wanted to create a Republic of Virtue in which citizens would live honest, moral lives and serve the community. Opposition to Robespierre continued to grow. More and more of the public, now that the military crisis was over, wanted a relaxation, not an increase, of the terror. In July 1794 Robespierre spoke for the need of the Committee of Public Safety to continue its activities. His opponents took a stand against him and on July 27 they voted for his arrest. He and his followers were quickly released, however, and they gathered to plan a rising of their own. But the opposition leaders rallied their forces; Robespierre and his supporters were captured that night and executed the next day. The period of the Thermidorian Reaction, during which the Terror was ended and France returned to a more moderate government, began with the deaths of Robespierre and his supporters. Hardman, John. Robespierre. New York: Longman, 1999. Haydon, Colin, and William Doyle, eds. Robespierre. New York: Cambridge University Press, 1999. Jordan, David P. The Revolutionary Career of Maximilien Robespierre. New York: Free Press, 1985. McGowen, Tom. Robespierre and the French Revolution in World History. Berkeley Heights, NJ: Enslow, 2000.